1. that part of the central nervous system that includes all the higher nervous centers; enclosed within the skull; continuous with the spinal cord [syn: encephalon]. 2. mental ability; "he's got plenty of brains but no common sense" [syn: mental capacity, learning ability, brainpower, wit, mentality]. 3. that which is responsible for one's thoughts and feelings; the seat of the faculty of reason; "his mind wandered", "I couldn't get his words out of my head" [syn: psyche, mind, nous, head]. 4. someone who has exceptional intellectual ability and originality; "Mozart was a child genius", "he's smart but he's no Einstein" [syn: genius, brainiac, mastermind, einstein]. 1. A piece of glass or other transparent substance with curved sides for concentrating or dispersing light rays. 2. optical instrument for correcting faulty vision consisting of a frame that holds a pair of lenses and that rests on the bridge of the nose and hooks behind the ears. Also called spectacles and eyeglasses. Brain and Glasses represents Victor Marín’s creative universe, where he conceives projects that encompass a wide spectrum of possibilities and operations based both on his imagination and creative ability (Brain) and on his way of seeing the world from his particular point of view (Glasses). 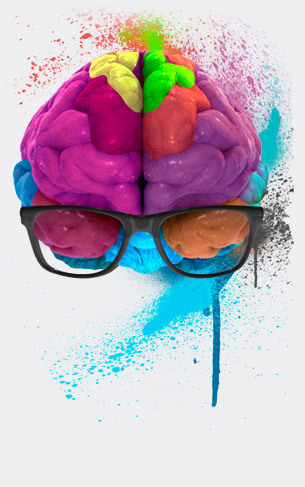 Brain and Glasses was born with the goal of bringing together in one brand all areas of artistic creation and creative research among which we find Graffiti, Painting, Design, Painting in the dentistry sector, and the LiMu and Lighting projects.